William T. King (known around town as Billy) has been instructing silverwork in San Miguel for 20 years. He has worked in the area of jewelry production since his first job in the mid – 1960 ´ s, when he worked as a gold grinder in Toronto, Canada. In the late 1960 ´ s he moved to the west coast of Canada, where he worked as a diamond sawyer and a saw designer for a company whose business was to send crews by helicopter into the mountains to remove slabs of jade boulders with diamond saws. During this period, King helped to design various saws which could be backpacked into areas inaccessible by other means; he led the crew that “proved” by diamond core-drilling the largest single gemstone known to the world at the time: a 26 ton gemstone of black nephrite. 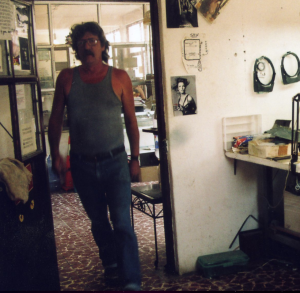 During the mid – 1970 ´ s, King came to Mexico and enrolled in Advanced Silverwork at the Instituto Allende, with instructor Robert M. Weaver, under whom he later studied privately for four years. Since 1982 King has been working as a commercial silversmith out of his own studio, gaining a reputation for clean work and meticulous finishing. He has been giving private instruction since 1986, with the majority of his private students having gone on to become jewelry majors, or jewelers in their own right. Mr. King has been instructor of “Silverwork for the Artist and Craftsperson” at the Instituto Allende since January, 1990. At the beginning of 1995 he became director of the Silversmith department and also began to teach “Creative Jewelry,” a course which included MFA and BFA level study. Mr. King retired from the Instituto Allende early in 1999 to establish the Sterling Quest School. He currently lives with his wife Anna and his son Joel in the countryside, outside of San Miguel de Allende. I feel that all teachers should take an oath similar to the Hippocratic Oath taken by physicians. If you decide to be a teacher, there should be no limitation in instruction, no secrets from the students. There should be no question of jealousy or envy on my part. 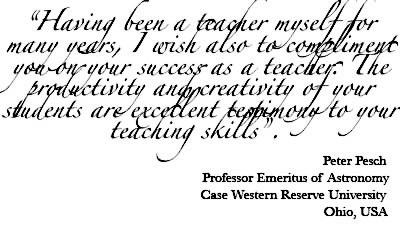 If a student displays the possibility of becoming better than I am at some technique; this is, after all, a goal all students should strive towards. As artists, we need constantly to question what we know, and endeavor to add to the great store of knowledge in the area of our medium; there is always room for innovation and change in the world of art.